In 2016 we started a project of 20 Bible Institutes (Seminaries) by 2020. Now, thanks be to God, we are implementing Phase 2 of that plan. There have been obstacles, and changes, but still on target. Iglesia Buen Pastor is small, ramshackle, and difficult to find. It sits off the main avenue down an alleyway that is closed with an unmarked door. A hose, possibly an “informal” water connection runs up the unpaved alley, which slopes up to the hill behind it. The houses that line the alleyway, as well as those that climb the hills around and behind it, are built of a hodgepodge of materials. Bricks, plywood, old signs, even cardboard. Whatever comes to hand has been used. Some have floors inside, others don’t. They can’t be reached by car. The “streets” are footpaths. The city built a stairway to the top of the hill at some time, but now it’s broken, making it difficult to climb to the highest houses. The people who live here are of extremely limited means. Many don’t have a good education. There are a lot of single-parent households and a lot of children who are at loose ends. 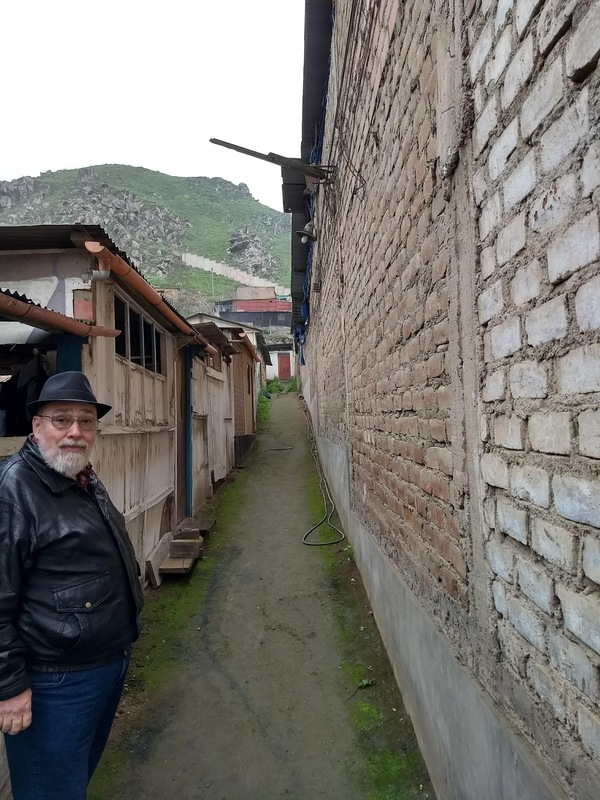 This ideal location for Christian ministry is where Gustavo Requejo and his wife Noemi, the church-planting pastor of El Buen Pastor (Good Shepherd), live and work. Gustavo is a large, bookish, and jovial man. He’s not afraid to teach. He has his congregation reading the Bible and talking about it. For example, he teaches them to understand the Old Testament by using a story diagram and training them to spot the stories, their settings, problem, climax, and what they teach about God. His church is growing. Even for a gifted teacher who has a lot of enthusiasm, a lot of teaching is going on here. As in most church plants, while Buen Pastor has a thriving children’s ministry, it has taken a while to develop leaders. And now that it’s not only progressing to having formal leadership but planting another church as well, the teaching burden is temporarily increased. Gustavo is a former student of Mike’s who is currently being considered for a scholarship from Southeastern Seminary in Louisville’s distance program. He is also a (Peruvian) church planting missionary with the Heart Cry Missionary Society. He has always known that inviting outside teachers and hosting conferences is a good way to both attract more people and lighten the teaching load. "Are you the duck that runs the gospel-mill next door?" "Am I the—pardon me, I believe I do not understand?" "Why you see we are in a bit of trouble, and the boys thought maybe you would give us a lift, if we'd tackle you—that is, if I've got the rights of it and you are the head clerk of the doxology-works next door." "I am the shepherd in charge of the flock whose fold is next door." That kind of mutual misunderstanding is all too common in seminaries here, and the uneducated only learn to parrot a stream of incomprehensible gobbledygook that they are incapable of putting in plain language. We have seen country pastors with degrees who went to US-funded seminaries who cannot answer simple questions about the Bible because they never really understood what they heard and nobody wanted to flunk them. To counteract this tendency, we decided to start off conferences and classes in small churches in Lima. We have a handful of qualified teachers, but they don’t necessarily have Mike’s experience in teaching uneducated people. Many of the small churches in poor areas would like to have conferences and don’t usually attract (nor can they manage) large ministry conferences. The South Lima area was settled mostly during the time of terrorism by people from all over Peru, so it is representative of the culture in other parts. And, regrettably, many of the schools are so bad that only 21.9% of Lima high school students tested in 2017 had adequate reading comprehension, so the people here don’t have a huge educational advantage over the rest of the country. We decided to use them as testing grounds for our Bible and other conferences. El Buen Pastor was one of the first churches that participated, and since then it has been the location of the premiere of most of our conferences. It’s actually become our home church in Peru. Starting our conferences out there and in other nearby churches, we see what sparks interest and learning and what doesn’t. And we can get teachers used to speaking in understandable language. Now as we are gearing up to do internet classes we needed a test Bible Institute (we call it a seminary here) where we could prepare church leaders and film the classes. Teaching to a live class will keep the teacher more dynamic and interesting. Many times in live classes the teacher spends more time answering questions than teaching his outline. We wanted to preserve that because it is really hard for a teacher with an advanced degree to grasp how little background his students have. We wanted the classroom to be unintimidating and a little rustic. Country people are very easily discouraged. Even the idea of filming a class is in part because watching the class is less intimidating than looking the lecturer in the face as in the usual online class. The one makes them feel on the spot, the other is like being a fly on the wall. All this makes El Buen Pastor a great location for the live seminary classes. Unintimidating, rustic, uneducated, with a qualified coordinator--it has it all. We have a few of these seminary locations preparing to go live. They will provide teachers to seminaries for groups of small churches to train their leaders. The edited recordings of these classes will become the basis for our distance classes, which will be taught at seminary sites and to individuals throughout Peru. The classes for preparing church leadership will be starting in March. Please pray for the classes and teachers. This is an entirely new way of teaching rural pastors here in Peru. And if this didn’t make sense to you in any way, please ask us about it. We’ll be glad to explain it better. We designed this presentation for camp ministry, but it's also a good intro to the ministry and Peru for anybody. It could be used in a missions moment as well, or possibly in Sunday School. You can get it to play with speaker notes by clicking on the gear and selecting that. If you want to use this and need any help please email us at missionarymike@gmail.com . We also have presentations on the geography, transportation, and foods of Peru. Let us know if you would like to use or see those! We've been visiting lots of groups and answering lots of questions. Some questions are so popular that we thought you might have them too! How did you become missionaries? Mike answered a call to missions in church as a teenager, but became alienated from a graceless church and wouldn't darken a church door until after Mike and Tammy's first child was born. After they both started following Jesus, they became youth leaders, and then Mike felt a reactivation of the call to be a missionary. Tammy's response: NO! If we do that we will never have matching furniture! IN U.S.: We spoke at Moss Bluff, and Grace Bible churches in Louisiana, and Beaumont Bible Church in Texas. We also led music at Elk Ridge Baptist in Texas and taught at Jr. and Sr. High Camps at Camp Pearl in Louisiana.